Following a request on last week’s Finagon post – the cardigan we created with John Smedley – here are some details on the rest of the outfit, above. One reader drew attention to the shirt collar, a button-down made by Satriano Cinque, the Neapolitan maker I use for most of my shirts. I think I’ve mentioned before that this is a design I created with the cutter, Luca, which involved moving the buttons that secure the collar a couple of millimetres higher. This gives the collar more roll, forcing it to curve outwards as its reach down the shirt is reduced. The biggest advantage of the design is that this roll remains when the shirt is worn with a tie. All too often a button-down lies flat when fastened under a tie, creating an unattractive, short point. This collar is also slightly higher than most RTW buttondowns. The shirt could be blue or white, but white is smarter and helps to create contrast. Elsewhere, we’re working with pretty standard menswear colours. Navy is the most versatile colour for knitwear and suiting (indeed almost anything apart from shoes, shirts and hats). And tan is among the most versatile for casual trousers. A reader requested more suggestions for outfits like this, that are formal enough for the office but fall between suit/tie and T-shirt/jeans. For me, the most important things here are fit and colour. Stick with a simple palette and pay attention to fit – a suit is flattering and formal because of the way it fits, as well as its worsted surface. The trousers are not actually Incotex, as mentioned on that earlier post (apologies) but a substantial cotton-twill from Panta Clothing. I haven’t written about Panta for a few years, but they’re worth considering for RTW trousers with an eye to bespoke detail. I particularly like these for the side tab sitting on the seam, not the waistband. The heavier cloth also makes them easier to wear with casual clothing. The shoes are unlined Edward Green loafers. For anyone who missed the Finagon posts, you can see more details on our perfect cardigan here. The model is not limited, but Permanent Style readers get free shipping for another three weeks. And midnight (worn above) is still available in all sizes! You can follow the discussion on Casual, summer, office attire by entering your email address in the box below. You will then receive an email every time a new comment is added. These will also contain a link to a page where you can stop the alerts, and remove all of your related data from the site. Nice. What weight is the cotton twill for the trousers? If you could that would be great. Thinking to have some trousers in this style, colour and fabric made up – perhaps by Solito. Which was the reason to ask. Would you see any reason why RTW is better than bespoke n this case? I think you have missed some of the Xs there Simon. I am envious of those Panta trousers. They look great, but don’t make it up to my size. I do like the look of the Merchant Fox trousers however. First thing I do on new OCBD’s is iron the collar and steam some roll into it. Never thought of moving the buttons but steaming it into shape seems to work for me. I too dislike that flat button down look. If you contact us, we would happily send you fabric swatches and can have pants made up in any size you please. That’s great to hear. Thanks Ed. I’ve sent an email via the contact from on your site. Simon, what is the British view on button-down shirts? They used to be the most popular collar in America for both with and without a tie, though now they’re worn mostly without a tie here. Great outfit Simon. I work in a very casual office but I love smart shoes and jackets and it’s a real battle to get the level of smartness right. 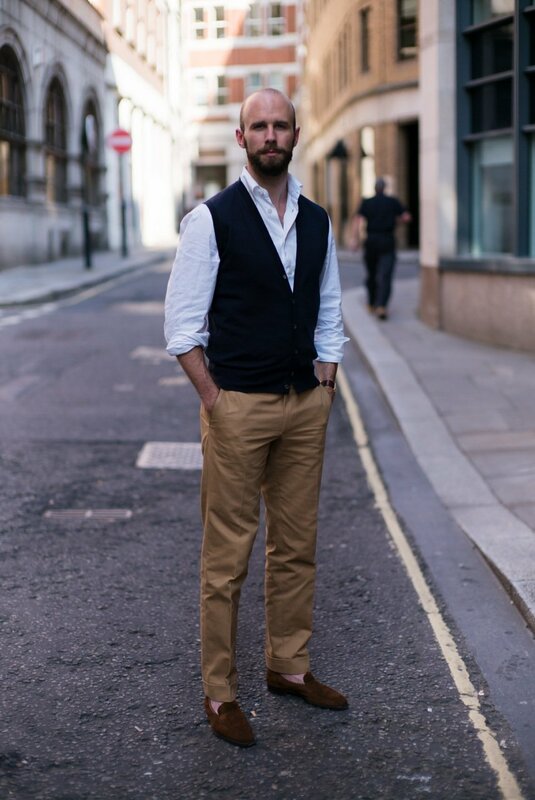 These posts on casual attire are really interesting and useful – just wondering if you’ve got more up your sleeve? I’d appreciate that as well, thanks.. I enjoy these posts as well. As I add more pieces to my collection, I enjoy the discussion about when the best times to wear things truly helpful, Thank you again. I’m a recent reader of the blog and love it. I’m very interested in this topic – clothes that are formal enough for the office but fall between suit/tie and T-shirt/jeans- primarily because I work in high-tech which has a very casual work environment. I am currently out looking to replace my navy blazer. I’m trying to choose what type of material is suitable for this “in between” category. Is wool cavalry twill one that may fit the purpose? Others you can suggest? I seem to be learning a whole new vocabulary since starting to read your blog. Following on from BK’s question/ you’re response. What finishes are best for semi casual/ formal? Great look. How do you feel about the width of your shirt sleeves? This is a nice combination! If you were to add a Summer jacket to this outfit for any causes, what kind would it be? Simon, I am assuming you never wear a tie with a button down (shirt) collar unless it is in a casual situation, and therefore consider a knitted tie more appropriate than a traditional silk one? Hi Simon, no I wear ties with button-downs in lots of situations. The tie is rarely a printed silk, but it might be a woven one, or indeed a knitted one as you suggest. this look is outstanding, can you give some details about the jacket? Rubinacci cashmere jacket – have a search for that on the blog. And yes, pale grey flannels from A&S. What is your opinion on breast pockets on OCBD shirts? I think it is more traditional (at least in the U.S.) to have a pocket, but curious if you have them on your shirts as it’s not visible in the pictures.